How do you offer support on your blog? Do you have a standard contact page that floods your email with questions, comments and concerns? A contact page does work if you don’t receive a lot of messages or if you have a team to help you out with correspondence. This ensures that you’re not overwhelmed. However, what do you do if you’re a one man/woman team and there is no one to help? If you’re receiving a ton of messages everyday, it becomes a never-ending chore that only gets worse. If this is the case for you, maybe you should provide service and support to your visitors and users in a different way. By “a different way” I mean a FAQ (Frequently Asked Questions) section. You’re sure to receive many of the same questions over and over, so why not provide a dedicated section on your blog to answers those frequently asked questions? Not only will this save you time and headaches, but your visitors can find answers more quickly and in most cases won’t have to wait for an email response from you. Not only are FAQs a great way to provide answers, but it’s also a great way to get your users involved because you can opt to have them participate as well – much like Yahoo! Answers and The Q&A Wiki. If your users are willing to share their knowledge, you might as well take advantage and allow them to help each other, right? That’s why today I’m going to share with you some plugins and themes for WordPress that allow you to add a FAQ section to your blog. Whether you’re looking to dedicate a certain area to FAQs, or want to use a domain or sub-domain to create a Q&A support site, these tools can help. WP-Answers can turn your entire blog into a Q&A website. Visitors can register (via email, Facebook or Twitter), which will allow them to ask and answer questions. There’s an admin panel so that you can manage everything from the backend of your blog. Google AdSense is also integrated into the plugin so that you can easily place ads in ad optimized areas. What’s unique about WP-Answers is that it can also automatically post questions from Yahoo Answers to your site – based on search terms that you specify. All replies on Yahoo Answers are also posted to your website. This is nice because you can pull in questions related to your niche to better help out your users and visitors. This plugin is nice if you’re just looking to add a simple, easy-to-use FAQ section to your blog. You must create the questions and answers yourself, categorize them and insert them into a page on your blog using a shortcode. Visitors can easily toggle the answers on/off for each question with a single click. This plugin allows for one-way interaction only; users won’t be able to answer questions or ask any of their own. “Degree3 brings the power of Social Q&A to your site, from the brains that first pioneered Q&A with Answerbag.com.” It does this by adding a Q&A section to each page of your blog. Doing this allows your visitors to see questions and answers directly related to the content on the current page. It also will help to keep visitors on your blog longer. Users can sign up with their email address or via Facebook to receive email alerts, vote on answers and add to discussions. A “Questions” tab will also appear on the right side of your blog next to the scroll bar, for easy access. WordPress FAQ is kind of like a mixture of WP-Answers and Q&A FAQ and Knowledge Base (both mentioned above). 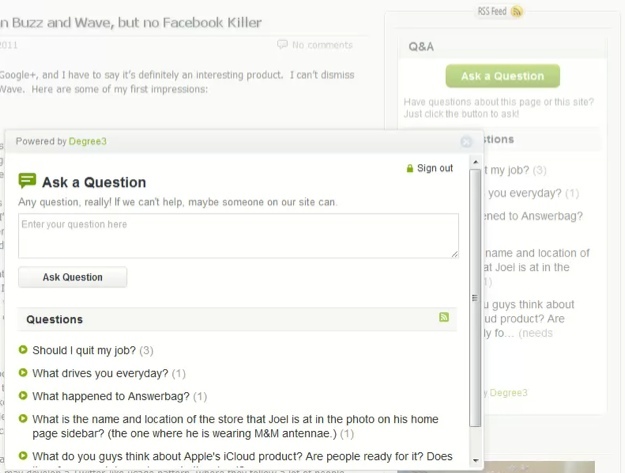 You can use the plugin to enter FAQ in the dashboard area, but users can also ask questions as well. You can choose to moderate questions or auto approve them. This plugin includes extensive configuration settings, a FAQ management system, FAQ groups (used much like categories), sidebar widgets for your blog, themes and custom CSS supported, related questions, a dashboard widget for your backend and much more. Sugar FAQs is another WordPress plugin that allows you to add questions to your blog. However, this plugin is a bit more stylish and colorful; it comes with six different color schemes. Your FAQ will be displayed in accordion style and organized by topic. It also includes a front-end FAQ submission form so that visitors can ask their own questions, which can be accepted or rejected by any admin or editor. Instant Q&A is a stylish WordPress theme that turns your blog into a robust Q&A site. It supports categories, sub-categories and tags for your questions. You can easily monetize your blog with the banner ad integration in the theme options; there’s also a place to add your Google Analytics code. Users can sign up to participate on your Q&A site and they’ll even get their own member profile and account page. The popular questions area and star rating system are both sure to encourage and increase user engagement. Templatic offers much of the same features as Instant Q&A. Your visitors can ask, answer and vote on questions, plus get their own profile. In addition, you can change money for questions if you want to. However, that’s probably not best if you’re using it as a dedicated support site. Right out of the box, you’re ready to get started with your Q&A site as Templatic includes sample questions and answers and the basic settings needed. 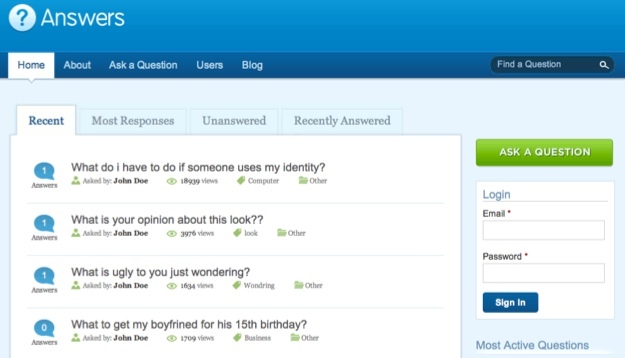 Along with a user profile, your users will have their own dashboard where they can manage their questions and answers. You may also like that Templatic allows you to have a standard blog along with the questions and answers part; it doesn’t just take over your entire site. Of course you also get theme options, color schemes and more. 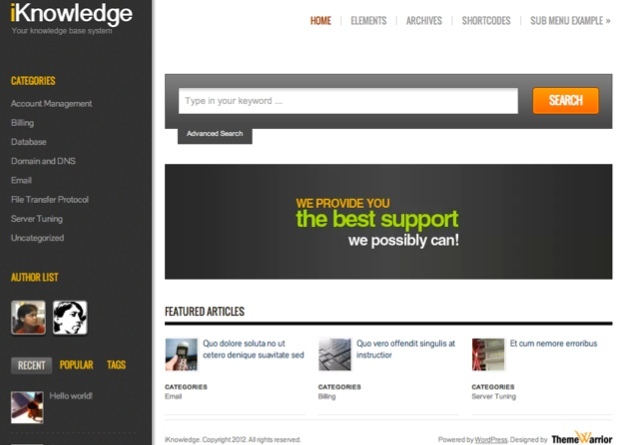 iKnowledge turns your blog into a beautifully designed knowledge base. It comes with a rating system and post view counter so that you can see which items are the most popular and most viewed. The homepage is widgetized, making it easy to truly customize the look via drag-and-drop. Along with this you’ll get four color schemes, eight custom widgets, theme options, SEO options and more. There’s also large search box at the top of each page with advanced search functions, making it easier for users to find whatever they’re looking for. Do you have a FAQ section on your blog or have an entire website or sub-domain dedicated to Q&A? If so, how is it working out for you? Do you prefer it over a standard contact form? Let us know in the comments section! I released a free theme a few weeks ago called “FAQ” – I think that fits well in here. Based on bootstrap and easy to customize. HI, thank you for your article! Maybe you can help me with my search. I am looking for the plugin where users can ask questions, but only admin can provide the answers. Ideally plugin to be free of charge. Would you know about any? Pavel. This is a very useful article. The FAQs you discussed can actually be modified to serve a range of other uses. It could even be blown out as a full communist forum with immense interaction. Thanks again. I am looking for a FAQ plugin that I can add as a page on my wordpress Blog, have you got any suggestions? Guys, you can check this one. It’s cheap and cool. Guys, you can check this. It’s cheap and easy to use. Even though you didn’t include us :), I have to say that this is a great post on some of the Q&A options out there. I thought I would reach out to you to let you know we exist. Our startup, Pubble (http://www.pubble.co) is a real-time Q&A plugin for websites, blogs & Facebook pages to crowdsource the best FAQ’s for anything. Pubble takes a different approach to most other Q&A plugins in that we put the Q&A layer on top of your existing content. We believe that your Q&A should live in context (i.e. the Q&A threads relate to the content page that they live on). We also believe that everywhere that you live online should work together to build your Q&A community on your site. Hi, these look great and will have to check them out. I show my clients how to update their WP sites on their own in a training session but they usually forget how to do certain things. I give them a PDF that has some instructions but most will still ask questions. Do you have any recommendations for an internal/admin side FAQ plugin or method that they could reference while doing the tasks? Appreciate any advice! I don’t know any internal/admin side FAQ plugins off hand. Maybe something like Edit Flow might work for you? FAQ Manager also looks pretty useful. I’m currently using WPMU’s Q&A but I’m not satisfied with it’s performance. I’m going to try Degree3’s Q&A plug-in when I do a site refresh shortly…. Sounds good. If you remember, come back and let us know how Degree3’s Q&A plugin works out for you!